you use your phone for everything! Maybe it’s when you go out walking, dancing, or you see a word and it sparks a great idea for a social media post? Whether in the shower, swimming or even relaxing by the pool on holiday – you can now capture and create all these great ideas and social media posts for your business – right from your iPhone. I’m gonna show you how simple and easy it is to create engaging posts for all your social media channels in minutes – all with your iPhone – you know the thing you carry about with you everywhere!? I promise, after just one day with Visuals on the Go, you’ll be designing creative posts and videos effortlessly. 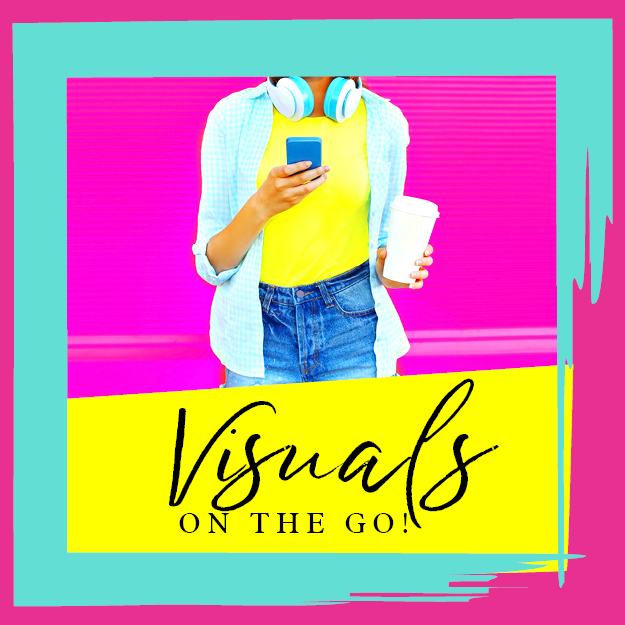 Visuals on the Go is a clear, concise and easy to follow mini-course that will get you quick results, enabling you to post quickly, learn the very best of the apps on the market to create engaging content and fine tune your design skills on the go. And all from the phone in your pocket! No video is longer than 20 mins. This is a short, snappy, get rapid results mini-course. I’ve found you the very best apps so that you don’t have to download every single one! Not every app is right for you. I’m cutting through the clutter and showcasing the best apps there are – both paid for and free. Let’s get capturing all your ideas NOW! It’s gonna be app-tastic! Plus you can also book a 10-minute complementary design dilemma call with me. Online course full of walk through tutorials. SIGN ME UP TODAY FOR ONLY £29!